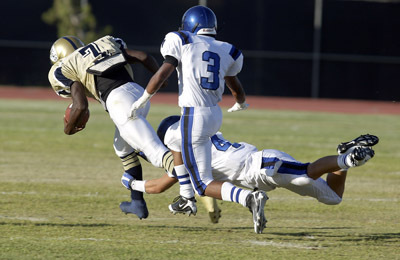 JOHN GURZINSKI/REVIEW JOURNAL SPORTS---Cheyenne's Marcus Sullivan breaks free from Sierra Vistas #3 Ryan Stevens and #4 Darian Yahyavi after catching a pass to score his third touchdown against Sierra Vista Thursday August 28, 32008. Cheyenne and Palo Verde have met for the Sunset Region football championship four times in the last six years. And though no title will be on the line when the teams meet at 7 tonight at Palo Verde, the game certainly has a championship feel. The Panthers (3-0) and Desert Shields (3-0) shared the top ranking in the latest Southern Nevada Class 4A coaches’ poll, and the winner figures to have a leg up in the Northwest League. Both teams have brought it so far. Cheyenne has outscored opponents 158-18 in three weeks. Palo Verde has a 125-12 edge. Both teams feature the double wing, though Cheyenne has shown several other sets as well. Both feature multiple weapons in the backfield, and both have been extremely efficient passing the football. Cheyenne’s Marcus Sullivan has been the most effective of the offensive weapons for either team. He’s touched the ball just 23 times in three weeks but has scored 10 touchdowns. He’s rushed for 380 yards on only 20 carries. “Marcus has always been explosive, it’s just that he got hurt early last year and he missed most of the season,” Cheyenne coach Charles Anthony said. “Now he’s pretty much doing the things that he’s capable of doing. Donnel Thompson (193 rushing yards), Jordan Butler (179 rushing yards) and Terrence Brison (178 rushing yards) give the Desert Shields three other options. And quarterbacks Chris Spencer and Kaeo Helakahi have combined to complete 7 of 12 passes, six of which have gone for touchdowns. The Desert Shields also finally have experience. Anthony said it’s the first time since the 2004 season that his team has had more than five seniors.